The Snickers Candy Bar is a chewy peanut butter nougat and caramel and roasted peanut topping candy bar covered in dairy milk chocolate made and marketed by Mars, Inc, a US based private corporation that is one of the world’s largest food and confectionary suppliers. The Snickers candy bar is sold throughout the world and over 15 million bars are made daily with annual sales of over $2 billion making it one of the most popular candy bars ever produced. Frank and Ethel Mars, the founders of Mars, Inc created the very successful Milky Way chocolae bar in the early 1920s, which was America’s most popular candy bar between 1927 and 1929 allowing the company to expand and develop new recipes for chocolate candy. 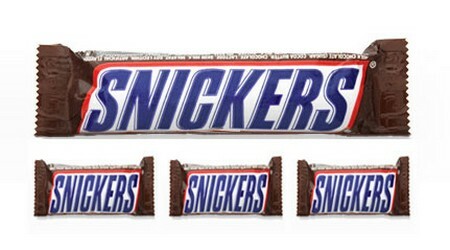 The Snickers bar took over three years to develop and wasn’t released to the market until 1930. Frank and Ethel also owned a farm that bred race horses in Tennessee, some of which were regular sweepstake winners, including Ethel’s favorite, a horse named Snickers. Sadly the horse died a month or two before the new product was to be released, an since a new name hadn’t been settled on, and the farm in any event had been named after the first chocolate bar, the Milky Way Farm, it seemed fitting that the next chocolate bar should take its name from the farm. By all accounts Ethel was delighted that the name of her favorite horse would be chosen. Snickers bars were originally made by pouring the peanut butter nougat onto a large tray, then adding the caramel and peanut topping, and slicing by hand before dipping each piece into melted chocolate. Of course the increasing use of machines to increase volumes made means that old hand made way is no longer practiced. It is a sign of the times that the first Milky Way bar sold for just 5 cents in 1920, yet the Snickers candy bar sold for 20 cents when it was first released in 1930. 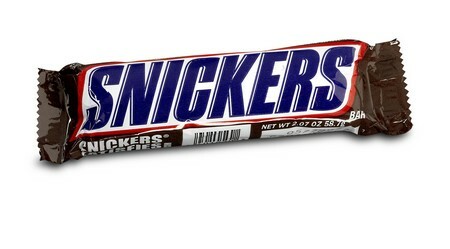 The association with a prize winning race horse inspired the Mars company to identify the Snickers candy bar with athletes, rumor has it that Forrest Mars Sr, while in Europe and estranged from his father back in the US, decided to brand the Snickers bar as the Marathon bar because of the high calorie count. After his father’s death Mars in the US came under his control and whilst the same candy bar continued to be known by the different names, they both became synonymous with performance sport. The end of World War 2 ushered in a golden age of radio and television advertising, the future was considered bright; democracy, capitalism and the American way of life were believed to be the pinnacle of human accomplishment, leading to major brands such as Snickers being associated with clean wholesome entertainment, and leading directly to Snickers becoming the main sponsor of The Howdy Doody Show from 1949 till 1952. Very little changed with the Snickers brand during its first forty years of production, except in 1968 when Mars were inspired to produce the Snickers mini candy bar which sold in bags of a dozen or more and were labeled ‘fun size’. Fun size candy bars were heavily marketed at parents concerned about the sugar and fat content of regular size chocolate bars as the ideal accompaniment to school lunch boxes and family snacks for the kitchen pantry. Snickers candy bars in the UK and Ireland had been known as Marathon chocolate bars since they were first introduced to the market in the 1930s, but by the 1990s Mars, Inc undertook a consolidated branding exercise aimed at bringing all of the corporations products under unified Mars branding that would be recognized globally instead of locally. Several company divisions were renamed using Mars as the division prefix, whilst many products including Snickers and Twix adopted the more globally known name. 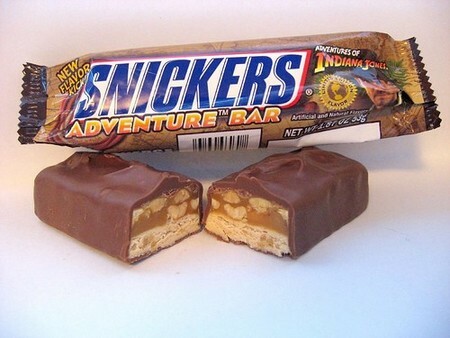 The Marathon bar was to become Snickers in line with global naming, and for a period of 18 months featured the catchphrase “Internationally known as Snickers”. After this time all Marathon candy in the British Isles were branded Snickers, although Mars Limited in England has renewed their trademark to the name Marathon provoking rumors they may re-use the name. Mars, Inc. and especially the Snickers brand has courted controversy in recent years with advertisements perceived to be homophobic, notably during Super Bowl XLI when two mechanics are seen sharing a Snickers and accidentally kiss when reaching the middle. The two actors immediately feel the need to do something manly such as drinking motor oil or hitting each other with a wrench. Controversially, the Snickers website showed a group of Super Bowl players reacting with disgust to the kiss, fueling protests that Mars, Inc. was promoting discrimination against gay and lesbian people. A similar controversy in England was the result of an advertisement featuring the actor Mr T who is seen ridiculing a power walker and firing a semi-automatic rifle in his direction whilst telling the walker to do something more manly. At the same time Mr T is seen eating a Snickers candy bar. Interestingly, protesters weren’t annoyed with the firing of a weapon, or of the ad ridiculing power walking, instead most commentators accused Mars Limited of homophobia since the power walker is portrayed in an effeminate manner. Significantly, neither controversial ad seemed to have damaged sales or caused any embarrassment to the Mars family although Mr T was forced to defend his role in the UK ad and lost work as sponsors recoiled from being associated with the perception of homophobia. In other parts of the world the Snickers brand has been more positively received with Snickers in Australia being a major sponsor of surfing, whilst in Latin America Snickers is known for supporting youth activities such as music and skateboarding. Sales of Snickers candy bars have continued to increase, and have become a major brand within the Mars, Inc. portfolio of products that has also experienced many varieties over the years beginning in the late 1980s thru to the present. Examples of Snickers branded products include the Snickers Ice Cream Bar, Snickers Cruncher, Snickers Almond Bar, Snickers Xtreme, Snickers Charged, Snickers Hazelnut, Snickers Flapjack and many more, all of which have been well received at the time and either continued in production or withdrawn after the promo ended.